Everyone knows that extra virgin olive oil offers unparalleled health benefits that benefit your heart, bones, brain and diet when used as the main cooking oil in your kitchen. With so many oils on the shelf, how do you decide which to purchase? 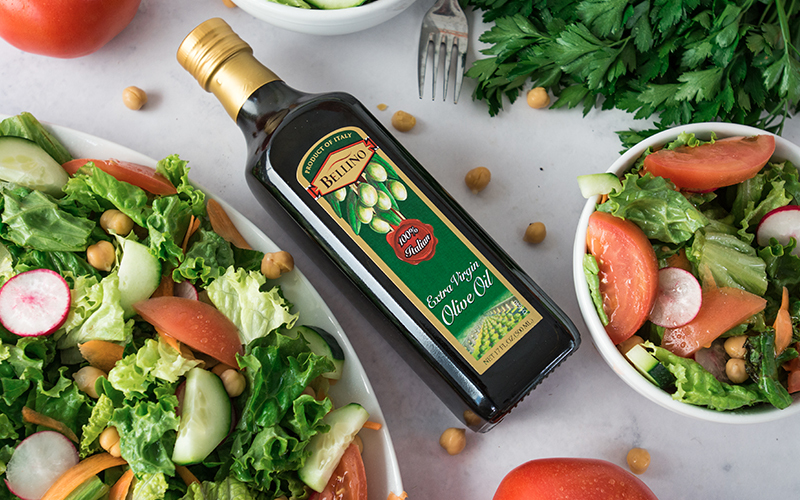 Choose the highest quality oil because knowing what you put in your body will help it function the best it can; choose Bellino Extra Virgin Olive Oil. No blending with refined oils, no additives and no alterations, Bellino Extra Virgin Olive Oil is made from the first cold press of single-origin 100% Italian olives. Our olive oil is crafted by an “Olio Fiscio”, a master Italian oil blender who, through great care and attention to detail, captures and balances the best qualities of each olive varietal to obtain the consistently rich olive flavor that you taste. 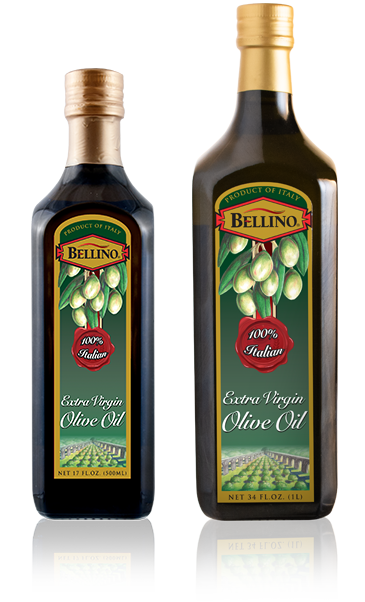 Discover the versatility and health benefits of Bellino Extra Virgin Olive Oil by incorporating it into your everyday diet as a finishing oil, an ingredient in salad dressings or Italian breads, as a substitute for butter in desserts, or to sauté, grill, sear or roast your favorite meats and vegetables. 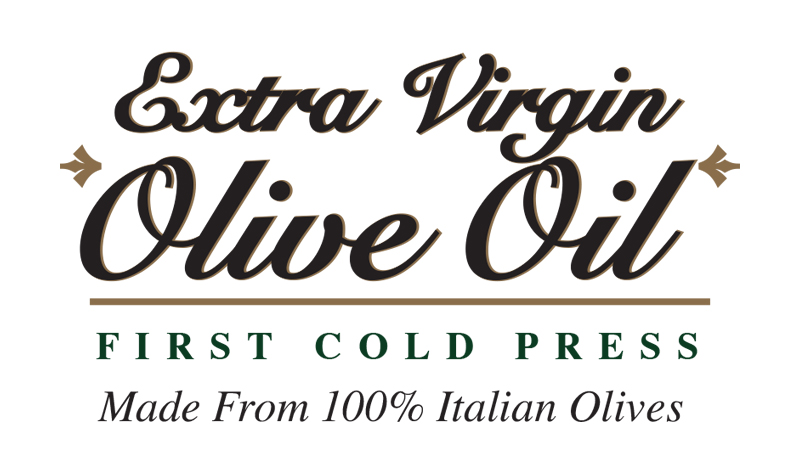 Bellino Extra Virgin Olive Oil is made from the first cold press of 100% single origin Italian olives and provides a rich olive flavor that can be used to complement a number of your favorite dishes. Packaged in a dark bottle for preservation with no added preservatives, this olive oil is perfect for everyday use. Bellino Organic Extra Virgin Olive Oil is made from the first cold press of 100% single origin Italian olives and provides a rich olive flavor that can be used to complement a number of your favorite dishes The USDA organic seal ensures that the olives are grown naturally and without the use of pesticides, providing an excellent source of monosaturated fats and antioxidants. 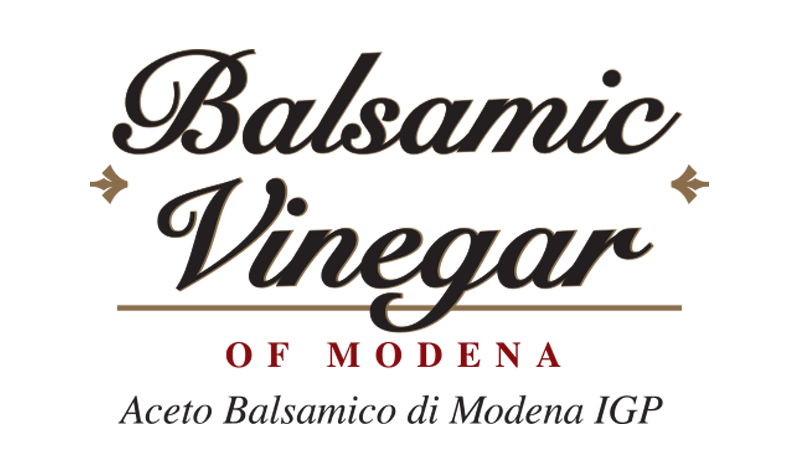 Balsamic vinegar provides the perfect way to add flavor to a dish without adding an excess of calories and fat, offering a delightful alternative to other high-calorie sauces or flavorings. This healthy condiment also contains different electrolytes, antioxidants, and phytonutrients that offer a wide range of benefits to assist in improving overall health. Consuming balsamic vinegar can aid in digestion, improve blood circulation, regulate blood sugar and lower cholesterol, as well as boost heart and brain health. Imported from the Modena region of Italy, Bellino Balsamic Vinegar of Modena is produced following a unique artisan process that has been used in Italy for well over four centuries. Bellino Balsamic Vinegar adheres to strict regulations involving the grape varietals used, the area in which it is produced and the aging process to earn the distinctive “Aceto Balsamico di Modena IGP” you see on our bottles. Known throughout the world for its superior taste and quality, Balsamic Vinegar of Modena has a velvety mouth feel, a complex tart sweetness, and a glossy, thick and smooth appearance. 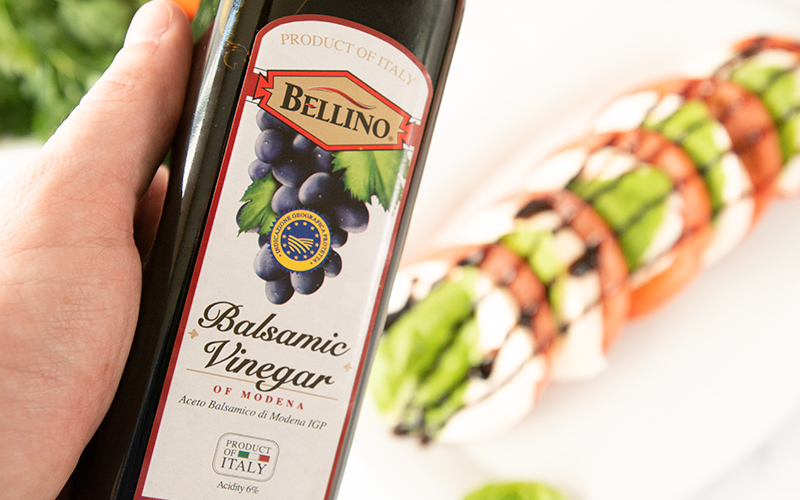 While balsamic vinegar makes a delicious addition to salads and perfectly complements Bellino Extra Virgin Olive Oil, this versatile vinegar has many additional uses that will take your dishes to the next level. Our line of everyday balsamic vinegars can be used as a marinade, to bring out the flavors in fruit and desserts, served with gourmet cheeses, or drizzled over roasted vegetables and meats upon serving. Bellino Balsamic Vinegar of Modena is exceptionally smooth with a traditional and tart average grape must and hints of cherry oak. IGP certified to guarantee our balsamic vinegar is made following traditional processes within the designated geographic region of Modena, Italy. An all-purpose balsamic vinegar ideal for everyday use. Bellino Aged Balsamic Vinegar has been aged more than three years, with increased grape must and a distinctive flavor of cherry oak. IGP certified to guarantee our balsamic is made following traditional processes within the designated geographic region of Modena, Italy. An all-purpose balsamic vinegar ideal for everyday use. Bellino Organic Balsamic Vinegar of Modena is exceptionally smooth with a traditional and tart average grape must and hints of cherry oak. The USDA organic certification ensures the grapes were grown and processed without the use of pesticides or additives. IGP certified to guarantee our balsamic vinegar is made following traditional processes within the designated geographic region of Modena, Italy.